Born and raised near Calgary, Alberta, James Funfer is proud to call British Columbia his home. He wrote his first novella-length story at age twelve and hasn’t stopped writing since. 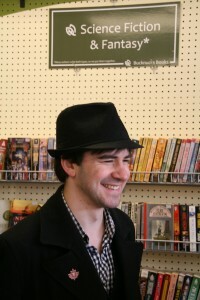 He writes short fiction in many genres and novel-length works in science fiction and fantasy. He spends his spare time haunting record stores and plotting role-playing campaigns. James Funfer’s first novel, Crystal Promise, is available now on Amazon.com – click here to purchase it. He is currently working on a sequel (Crystal Secrets), as well as a science-fiction story called Chasing Lucifer and an as-of-yet untitled speculative series about a fictional cold war. Follow his serial post-apocalyptic story Doom’s Daughter on wattpad.